McDonald’s UK has struck a deal with eReading provider Kobo to offer its Happy Meal buyers access to free digital books, as part of its plan to deliver a “fun, enriched experience” for customers. Launching today (30 April) in conjunction with the new ‘Secret Seven’ Happy Meal book promotion, an e-book voucher will feature on every Happy Meal box enabling parents to download a free children’s e-book compatible with a wide range of electronic devices and operating systems. The e-book voucher partnership with Kobo was negotiated by The Marketing Store. The new e-book voucher is part of the fast-food giant’s ‘Happy Readers’ campaign, which has seen two annual books promotions giving away millions of popular children’s books. 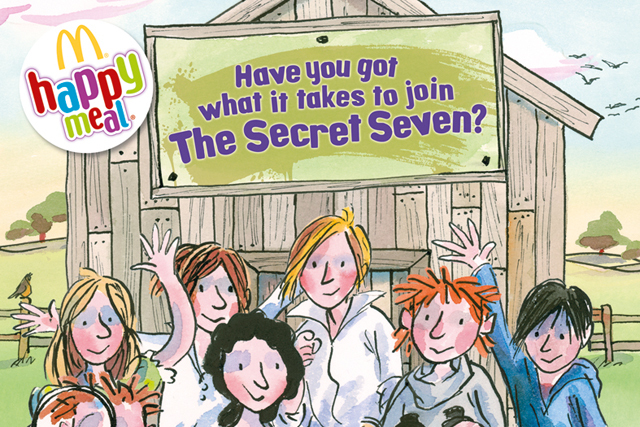 The tie-up with Enid Blyton’s ‘Secret Seven’, published by Hodder Children’s Books, will be running for five weeks in McDonald’s restaurants nationwide from today. Six short stories from the author’s ‘Secret Seven’ collection, featuring exclusive colour illustrations by illustrator Tony Ross, will be available in-store as part of the Happy Meal. Two additional ‘Secret Seven’ and ‘Famous Five’ titles will also be available to parents and children through the £1 book voucher redeemable at WHSmith or Eason. The free Kobo eBook download available at www.kobobooks.com/uk/happyreaders until Tuesday 17th June. Alistair Macrow, senior vice president, chief marketing officer, McDonald’s UK, said children had "come to know and expect content in digital form". "Since leading the charge with free wifi in 2007, we’ve introduced a number of digital innovations to enhance our customers’ experience including the McDonald’s UK app, contactless payment as well as tablets and digital floor play in restaurants. "Our free e-books are the latest way for us to deliver a fun, enriched experience for our customers at no extra cost to them." Michael Tamblyn, president and chief content officer, Kobo said: "We hope the new option to enjoy digital versions of quality, children’s books through the Happy Meal will inspire more UK families to build their own personal libraries and read more together."